Because collectors are free to indulge their vision, venturing into new or unfashionable areas, they can lead taste. They can also collect an artist or a period in depth. 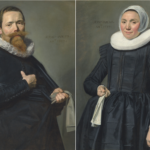 The van Otterloo collection is an example: its 70 Dutch and Flemish paintings were purchased over the last few decades by the couple to illustrate every genre by master painters of Holland’s 17th-century Golden Age. It is worth $250 million or more, and no museum today could afford to assemble it. Purchases by museums tend to be more conventional, reflecting taste and covering the bases, rather than specializing. That is due, in part, to a lack of money. Also, Mr. Ravenal explains, “for museums to acquire, it’s a laborious, multistage process, and sometimes a dealer won’t hold on to a work through it.” Typically, museum purchases must pass muster with trustees. Not every collector has had as much foresight as the Steins or as much focus as the van Otterloos, of course. But Mr. Cuno notes similar “moments” of collector boldness in Chicago. “There was one around Monet, who was alive when our collectors collected him, and the richness of our Impressionist collection is a result,” he says. “And there was one around surrealism,” when the Art Institute patrons Lindy and Edwin Bergman in particular bought works by Dali, Tanguy and others, which were given to the museum.